She grew up in the South - the South side of Memphis, Tennessee to be exact - and the Southern attitude and way of life have played an integral part in her life. She's opinionated, strong and fiercely loyal. She's a tremendous protector of what's right and a guardian of the way things ought to be. She believes in God above all else and holds her family dear to her heart. She's Cleveland City Councilwoman, Fannie Lewis, and love her or hate her, you will agree she's a force to be reckoned with. Born June 6, 1926 Fannie first came to Cleveland to avoid the discrimination and segregation of the South. She was a young married woman with four children at the time. She and her husband uprooted their lives and came north to Cleveland hoping to live a peaceful life. What she found instead was discrimination "ten times as strong" as in Memphis and she was about to face struggles she had never even considered back home. The Cleveland lifestyle (never mind the snow, which she still hasn't gotten used to) was so different than what she had been raised on. "In the South there was always work to do and food to eat. You could always work on somebody's farm to make a dollar or pick fruit from a tree to feed your babies." The harvest from the large gardens was always shared with the neighbors. "In the North you had to have a job to make money to buy food. And jobs were hard to find." Family life was different up North too. "In the South" says Fannie " if you were rowdy or liked to party, you didn't hang with the church folks." The lower end of town housed the honky-tonks and saloons; the polite church-going people didn't have to deal with all that. In the North she found everything to be everywhere. There was no good or bad neighborhood. "Sassy and floozy women could be living right next door to a God-fearing woman". The ladies Fannie grew up with never wore pants, smoked cigarettes or even whistled. "You had to carry yourself to make men respect you." She misses those days when morals and values meant more to everybody. "When Black folk left the South to be free in the North to do whatever, they dropped what they learned in the south - it became Honky-tonk Land." She has high regard for the sanctity of neighborhood life. Growing up she knew better than to try and get away with something - everyone would tell. "You might as well do it in front of your parents." People cared about each other; something Fannie feels is lacking in today's world of "me" and "I". Church was a way of life for Fannie as she was growing up, and it is a major part of her life today. "If you didn't go to Church you were looked at as someone who didn't care enough to live right". It was a day when your word was gold. If you said it, you were expected to do it. If you earned a reputation for not keeping your word, you were virtually ruined in the town. This is yet another lesson Fannie has taken with her into adulthood. Her word is her bond. Her family taught her the importance of truthfulness. Her father would fill a porcelain bowl with water and tell her to put her finger in it. If she was lying - it would shake, but an honest word would leave the water calm and still. Even with the discrimination and segregation, she calls it the "best place to have grown up." She was taught values and principles and she has never forgotten them. "If you plant a seed deep into the ground it will take root and grow and there's nothing that will make that seed falter. The seeds my family planted in my mind were planted deep and so the roots are deep. And they aren't going anywhere." People were close to the earth in the South. "The North has asphalt - people have never had their hands in the dirt. Never seen a baby chicken or the young of animals. Never went up a tree and fell out or swam in a river. Most haven't been out of their neighborhood." Fannie was married at age seventeen and had her first child by eighteen. 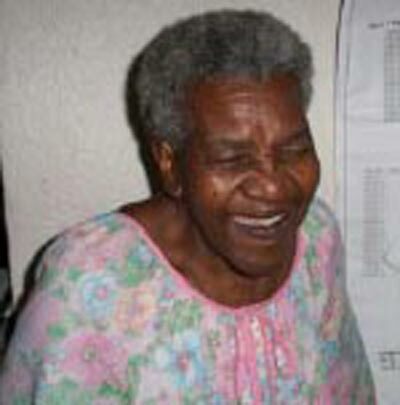 She is the mother of five children and grandmother and great grandmother to nineteen. She believes in discipline and the need to teach children right from wrong. She taught her children to have manners and say "Yes Ma'am" and "No Ma'am"; not for fear of any person, but out of respect for your elders. Her father had taught her to never fear another human being, but to always respect them. Fannie fears that youngsters do not know the how and why of things. They just know how to get what they want, not what went into making it or supplying it. "It's an instant world and if a youngster has to walk a little way to get something they want, they just don't want it anymore". "I heard about 'responsibility' so often, I thought it was a person. If only I had retained more of what my father taught me, I'd be ten times further along now". Her father was a master carpenter who used his craft to teach her lessons about life. She learned about balance in her life while holding the plumb line or level for her father. She learned about commitment while watching him take on jobs. He taught her to always have a plan and be prepared to accept consequences. "If you think the outcome could be bad" he'd tell her "or if you don't want to accept the consequences, then just don't do it." She got her determination from her grandmother. She was a "grand lady but rough." She made lye soap and scrubbed the house (and people) with it. Anytime Fannie would say she didn't know how to do something her grandmother would respond "Do you want to know how" and of course, a wonderful teaching experience would follow. Her parents and grandparents all taught her the importance of completing a task. "Loose ends will come back and slap you in the face the first time there's a contrary wind". Fannie took all of these lessons and her strong rooted faith and brought them with her to Cleveland, but she faced hard times here. She held on to her faith that "The Lord won't leave you hanging without some resources." She knew God had something in mind for her; she was just struggling to determine what it was. 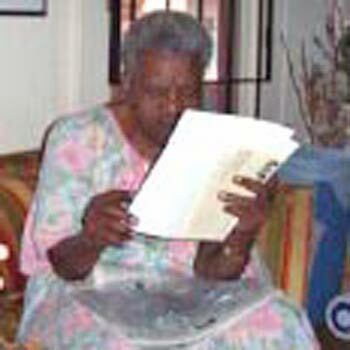 A woman by the name of Lugenia Dixon came into Fannie's life and things were about to change. Fannie knew nothing about politics the first time she ran for City Council, but with the help of her new found mentor and friend, she was ready to try and correct some of the things she knew were not right and make this place, her home, a better place to live. "Staying focused on the results was important to me. But it's not enough. You can't just stay focused - you have to focus on something positive." She first ran for council in 1971 and lost that race and the next four, always coming in second. Then in 1979 she learned a little about the "game of politics" and got out there and knocked on doors and looked people in the eye. She made promises: "There will never be eminent domain in my ward" and "I will be available to you 7 days a week, 24 hours a day". Fannie has kept her promise. During this interview the phone started ringing at 8:30 Saturday morning and did not stop while we were there. Constituents reporting drug buys, asking for advice, looking for help. 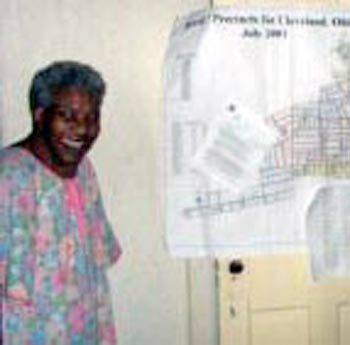 And Fannie Lewis answered each call and did her best to fix each problem. She counseled people, quoted Scripture and gave advice. "When you're the representative, you make yourself available." She was up till 3AM the night before - "People's problems never end." She continued, "We've got to do something about drugs. It's killing our children and taking away their hope. Even if they don't die, without hope, they might as well be dead". She loves her home on Starr Avenue. Between 1951 and 1963 she moved 10 times in Cleveland. She missed the porch and yard swings of the South. In Hough, they had cut up big houses and made them into apartments - "people with all different morals lived together." She had lived in Central, Mt. Pleasant and Glenville but the Starr Ave home was the first home that she and her husband owned in Cleveland. "Home ownership gives you control and stability" and this is the essence of what she wants for Clevelanders. Her house is the focal point of the family. The kids and grandkids "always know where home is - that's where Grandma is." "Owning a home gives a person roots and make them care. They're going to carry me feet first out of this house" And it is partially this love of her home that makes her fight so hard to keep her neighborhood safe and secure. "Everybody knows where home is and you have to be able to go there and feel like it's your special place - you're home"
But it is more than just her personal well being that keeps Fannie Lewis motivated. It goes back to the days in Memphis where she learned the importance of taking care of other people and helping wherever you could. If she was feeling the hard times of the neighborhood, so were her neighbors. She knew she could make a difference. Her battle to sit on City Council provided her with some pretty substantial opponents. She fearlessly took on the likes of George Forbes (also from Memphis, but from rival East Memphis, Fannie is quick to point out), Morris Jackson and Arnold Pinkney. George Forbes, City Council President at the time told her she would never be on council. She remembered her father's words about not fearing any human being and she told him "You ain't God - I will be there". Always true to her word - she was and still is a prominent, vocal and active member of City Council. "You must plan your battles. Not everything is worth a fight, but if it is, fight hard. But don't let anybody pull you into a fight you don't want to fight"
"If good things aren't coming in, it means you aren't giving any out." "Nothing supplied by Satan will ever last. Nothing supplied by God will ever fade away"
"Never run away from a problem. Problems can run faster than any of us, and they'll always be there to greet us when we get to the next stop." "Negativity is like static on a telephone line. It interferes with your success and doesn't accomplish anything"
"You can't stop someone from disliking you. They're allowed. But that doesn't mean you have to dislike them"
"You're not going to lose unless you become negative." When Fannie first came to Cleveland she had a deep-seeded hatred for white people. She saw things in Memphis and heard stories that made her hatred consume her. But due to the unlikely help of reputed gangster, Mickey Rini, she learned that her prejudice was unfounded. When she was assigned to work for the Democratic Party at the Alta House in Little Italy, Mickey introduced her to his friends in Murray Hill as his friend and she has never forgotten his kindness. She learned "The foot on the neck keeping a person down is the problem - not the color of the foot" She now believes there is no reason to discriminate and has created many strong friendships with white people and works side by side with whoever is willing to help her. "If help comes in a brown paper bag in a dog's mouth - you take it." She speaks with respect of then-Mayor George Voinovich who worked with her to transform her neighborhood. He marched with Fannie through the front door of the Union Club and introduced her to the powers of the city. It was rare at that time for a woman to even enter the Union Club, let alone a Black woman. But she and Voinovich carried it off. When she went back to visit her home in the South she stood at the front door of the now integrated train station. She didn't know if she wanted to go through that door that she was prevented from entering before. As she pondered, a redcap came by and said, "You must be from the North." She fights ferociously for what she believes in. She worked on having a school voucher program passed for seventeen years and was finally successful this year. She created the beautiful Lexington Square at 79th and Hough against all odds. She is excited about renovating historic League Park. She is attacking the drug problem with the same passion and zeal. If anyone can win the battle, it's Fannie Lewis. Her faith in God is paramount in her life and she takes the values and lessons of the Bible with her everywhere. She is a strong woman with strong principles and morals and certainly not someone to be ignored. "You gotta respect what God made. He didn't make any mistakes. So if there's a problem, God will have an answer. You just have to be ready to hear the answer and accept it." Fannie Lewis is the answer to many people's prayers. Her daily prayers continue for a safe, drug-free environment for children to grow up and prosper in. She prays for hope and peace. She prays for harmony. She prays for Cleveland and she prays for you and me. 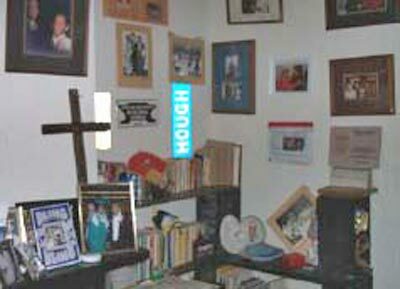 Those are the words Fannie Lewis yelled to me as my sister and I left her Hough home. We had been there early one Saturday morning to do a profile of the powerful Cleveland City Council member. 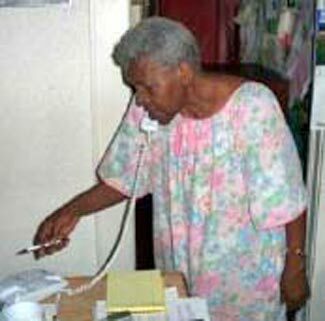 It was very early in the morning and Fannie was still dressed in her nightgown but she was busy working the phones as people from her neighborhood called for help. Watching her work the phones was impressive. She was decisive, firm and no-nonsense but she was also compassionate. You could tell that her life as councilwoman in Hough was a 24x7 job. And that she loved it and the people of her Ward and the city of Cleveland. After the interview, she asked about us and our business. She congratulated me for looking after my sister and as I walked off her porch she cried, "You da Man!" I looked back, grinned and waved and as I got into the car across the street she yelled it again. She had no higher political ambitions - she was focused on the people in her city and especially in her beloved Hough area. 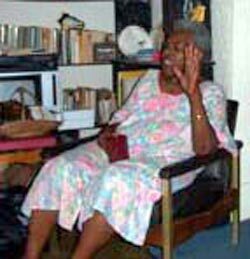 In these times of political corruption and "what's in it for me" a dedicated, caring public servant like Fannie Lewis was will be harder and harder to find. She will be missed. Our prayers go out to her friends and family. Copyright � 2002 ClevelandSeniors.Com. All Rights Reserved.